There are seven pathways of SohKiDo®, or the Way of Transpersonal Creativity. The final volume in Dr. Sky’s inspiring fivebook SohKiDo series explores Pathway VII, Therapeutic Noh Theater. As a student of theater in Helsinki, Finland, Dr. Sky became acquainted for the first time with the ancient Japanese Noh Theater and its meditative power. In Kyoto, Japan her encounter with the authentic Noh inspired her to begin creating her ideas and concepts for therapeutic theater with Individuals with Differing Abilities. 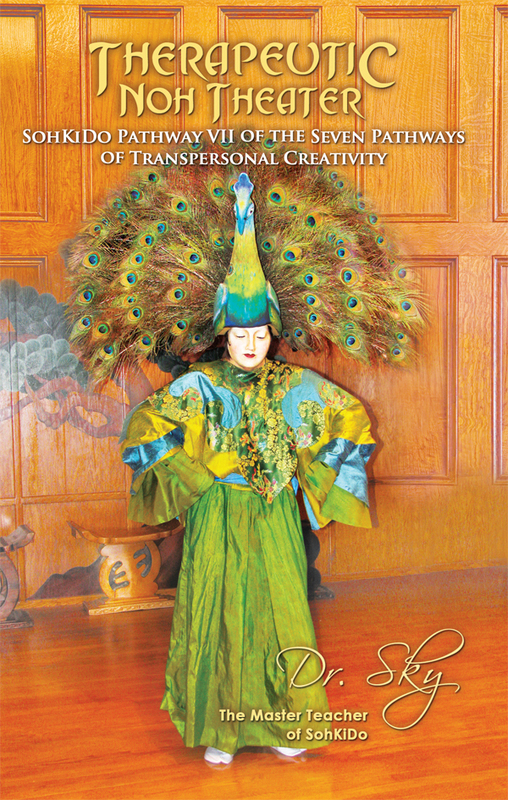 This volume is an essential tool for both future Therapeutic Noh Theater practitioners and those looking to connect with what Dr. Sky calls its “transpersonal essence.” Building on the newly created concepts of transpersonal psychology, stillness, silence, meditative movement, and masks, Dr. Sky describes how this “theater of the heart” enables the participants as well as the audiences to experience spacious present moments of healing transformation. In addition to learning about Dr. Sky’s fascinating history with Individuals with Differing Abilities, you’ll also enjoy more than fifty touching and beautiful images taken directly from Dr. Sky’s Therapeutic Noh Theater performances. Drawing on more than forty years of working with her beloved population of Individuals with Differing Abilities, Dr. Sky shares her groundbreaking work in writing, producing, directing, choreographing, and costuming nearly thirty original Therapeutic Noh Theater productions. Her work urges us to see Individuals with Differing Abilities not as defined by their disabilities, but as our spiritual teachers of patience, unconditional acceptance and love, but most importantly as our teachers of living in the present moment without self-importance of cognitively created ego constructs and identities. Dr. Sky (Sirkku M. Sky Hiltunen, Ph.D., Ed.D., RDT-BCT, ATR-BC, BCPC, LPC, REAT), a native of Finland and an American Citizen, is the Co-founder, the Executive Vice President and the Director of the Creative Arts Therapies at the Art and Drama Therapy Institute, Inc. (ADTI) in Washington, DC. Dr. Sky is a creator of numerous trademarked methods, tools, concepts and terms inspired by ancient spirituality, wisdom traditions of the Finnish mythological epic of Kalevala, and the classic Japanese Noh Theater. She is a passionate landscaper of meditative Japanese-style rock and Zen Gardens and she has a black belt in Tai Chi. She is poet, artist, scholar, playwright, and a contemporary mystic Christian, who lives by faith, intuition and creativity.